Be sure to check out our clearance items too. This voucher code is proudly presented and valid for all serving members, ex-forces and immediate family members. 1. Click ´Get Code´ to get the code and open the Cycle Surgery site. Cycle Surgery was founded out of a basement in Islington in 1992. It was originally just a bicycle workshop, but has since grown to be one of the UK’s largest bike stores. There are 30 Cycle Surgery shops across the nation plus their website, which makes it easy to get top quality bikes, clothes, and equipment in a moment’s notice. They sell a variety of different bikes for whatever type of cycling you’re into, including road bikes, mountain bikes, BMX bikes and more.All from some of the best brands in the industry. Cycle Surgery sells the top brands in the industry including Specialized, Cube, Orbea, and many more. Whether you are looking for bikes, safety equipment, or the latest in cycling fashion and performance clothing, Cycle Surgery has it. In addition to all of the great bikes and products they sell, they offer many services. You can call any time and speak to a member of their expert staff who are passionate about bikes to get advice on everything from the right equipment, maintenance, and buying your first bike. You can also take your bike in to one of their many locations to have your bike checked, repaired, parts replaced, and so much more. With most repairs being completed the same day you will be back out on the road in no time. Save by using this voucher code today! 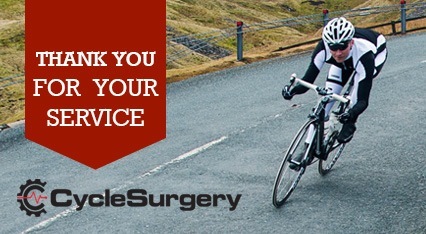 This offer code entitles you to 15% off your purchase of £20 or more is valid online at cyclesurgery.com on full price items only by entering the code at checkout. This offer cannot be used in store. The offer can only be used once. The offer cannot be used in conjunction with any other offer or promotion and is not valid for the purchase of gift cards/vouchers. The discount will not apply to delivery charges for purchases online. There can be no cash alternative. This offer code cannot be exchanged for cash. This offer code can only be used by the recipient and should not be passed on to third parties. Normal refund policy applies. Offer not open to employees of the Snow+Rock Group. Promoter: Cycle Surgery, The Rock, 2 Thornberry Way, Guidlford, Surrey, GU1 1QB.